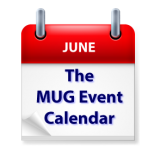 Apple’s World Wide Developers Conference and whatever announcements that are made will be the topic of discussion at Apple User Groups everywhere this week (and for weeks to come), but some other topics are notable on the agenda. They include a presentation on WiFi by Lee Hutchison of Ars Technica in Texas, Home Automation in Florida and replacing a laptop with an iPad in Australia. Other topics include network attached storage, Apple TV vs. Roku, Apple vs. FBI, Nissus Writer Pro and more.